Premium, rubberized asphalt coating that is uniquely fortified with specialty elastomers. 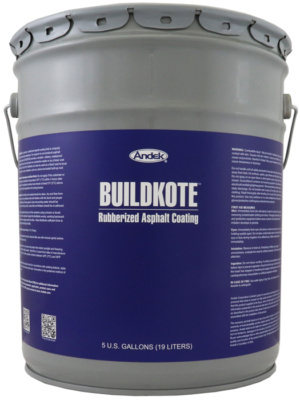 Far superior to conventional asphalt emulsion products, BUILDKOTE provides a durable, rubbery, waterproof membrane that can be used alone as a protective sealer or as a base coat for Polaroof RAC or SILVER FILM. BUILDKOTE can also be used as a flood coat to level and smooth an uneven substrate, such as a stone-encrusted built-up roof. BUILDKOTE is a premium, rubberized asphalt coating that is uniquely fortified with specialty elastomers. Far superior to conventional asphalt emulsion products, BUILDKOTE provides a durable, rubbery, waterproof membrane that can be used alone as a protective sealer or as a base coat for Polaroof or Silver Film. BUILDKOTE can also be used as a flood coat to level and smooth an uneven substrate, such as a stone-encrusted built-up roof. Increases the effective service life of the substrate. Maintains good adhesion and strength, even under ponding water. Flows around encrusted gravel to penetrate and seal the substrate. May be used below grade to seal exterior basement walls. Will accommodate substrate movement and thermal stresses. Remains flexible, rubbery and pliable. Single component formula means no measuring or mixing. All surfaces to be coated should be clean, dry and free from oils, grease, or any substance that will interfere with the bond and proper cure of Buildkote. All loose gravel, dust and ponding water should be removed from built-up roofs. Loose felts and blisters should be re-adhered. Buildkote is applied directly out of the container using a broom or brush directly onto the substrate. Spread the Buildkote evenly, working backward moving from one edge toward the other. Allow Buildkote sufficient time to cure before permitting foot traffic. Clean tools and equipment with water before the POLAROOF AC dries; after that solvent cleaning may be necessary. Do not apply to frozen or saturated substrates. Protect product from freezing. Store between 45°F and 90°F. Store out of direct sunlight.